Little, Brown Books for Young Readers, 9780316056960, 40pp. One of the most acclaimed children's book illustrators of our time now takes his legendary skill with watercolor to new heights in this lavish visual adventure. As a curious little chipmunk leaves his nest to greet the twilight, he gazes at the glittering sky above him. He can't help but also notice the sparkling dewdrops on a spider's web, the lights of the fireflies, and the shimmers of moonlight on the water. "How I wonder what you are!" marvels the tiny creature, launching a dreamlike quest to reach for the stars. 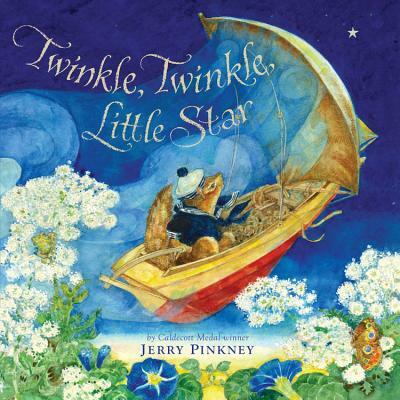 Inspired by one of our most popular children's lullabies, Jerry Pinkney's gentle world--where the loving arms of nature embrace us despite darkness or uncertainty--is perfect for easing little ones into dreamland.